Leah Kuypers' Zones of Regulation® curriculum comes with all kinds of lessons and a CD with printables. I strongly suggest you invest in this book; I believe it's the single most helpful resource I own. Read my very brief overview of the approach here. These activities assume you have already laid the groundwork and are looking for other activities to reinforce concepts and keep kids engaged. Some can also be used on their own, of course. Zones® Twister - I keep this very simple (meaning I don't make a new spinner or write anything on the mat). When you have to put a hand on a color, you have to tell a time you were in that color zone. When it's a foot, you have to name a strategy you would use at school to stay in or get back into the green zone. Zones® M&M Game - For some crazy reason, this one is very popular. Since I can be sure I for one have clean hands, for each turn I reach into the bag and pull out an M&M for each student. You can either have them name a time they were in that zone, or a strategy they can use to stay or get into the green zone. If they get orange, I have them answer a fun question like what they'd do with $1000, or what they'd like to invent, or who's their favorite Teenage Mutant Ninja Turtle. For the brown, I make them do something goofy like an evil laugh, pretend they're putting on lipstick, or act like they're throwing up a hairball. This is how I get my kicks, people. If you have more scruples you can switch it up any way you want---they're all about the candy anyway. :-) Don't forget to ensure there are no food allergies. UPDATE: Since I wrote this, I've changed my approach somewhat in that instead of asking a fun question if someone gets a brown or orange M&M, I dump out the bag beforehand, eat all the brown and orange ones myself, then put the Zones-colored ones back in the bag for the game. I find this much more satisfying, but you do what you want. Size of the Problem & Size of the Reaction - Here is a How Big is This Problem? worksheet you can use following your discussion(s) of the size of problems. I deliberately didn't put any kind of scale on it (e.g., S, M, L; 0 - 5) since it depends on the level of the students and the way you've presented the concept. Here are two visual charts you are welcome to use as well: Size of the Problem and Size of Reaction. Books or stories that illustrate a discrepancy between the size of the problem and the size of the reaction: Chicken Little, The Zax (in The Sneetches and Other Stories by Dr. Seuss). These also lend themselves well to discussions about expected and unexpected behaviors and how they make other people feel about us. Feelings Beanbag Toss - I adapt this idea from therapist Pam Dyson so that instead of having kids toss a beanbag or ball into buckets labeled with one of four feelings, they toss them into buckets labeled with the four zones. You can either have them name a time they were in that zone, name a feeling that falls into that zone. or give a strategy they could use to get into (or stay in) the green zone. ﻿Zones® Uno﻿ - Add a twist to the card game Uno. Whenever anyone changes a color they have to talk about a time they were in that color zone (or, as above, name a feeling in that zone or a strategy for dealing with that zone). These Emotional Regulation Task Cards are available in my TpT store. 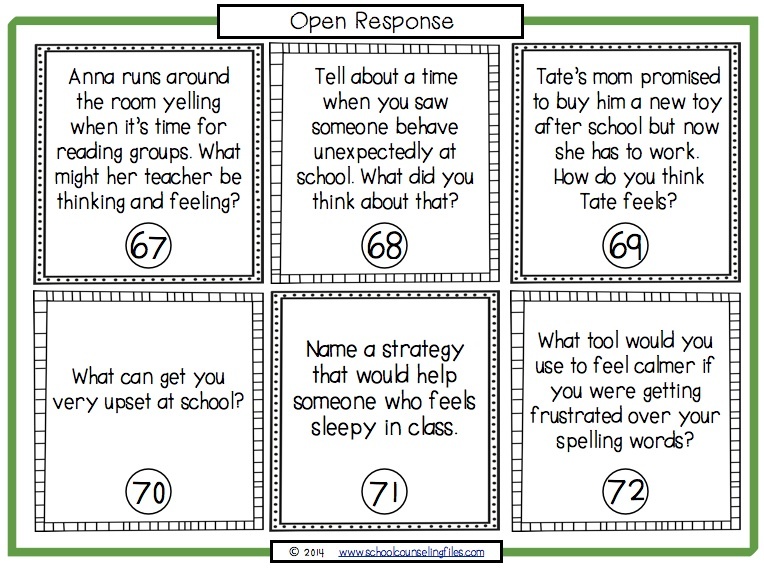 No matter which program you’re using to teach emotional regulation skills, these 72 multiple choice and open response cards will reinforce your lessons and help you collect data on students’ understanding. Cards cover Identifying Feelings, Size of the Problem/Size of Reaction, Expected and Unexpected Behaviors (Impact of Behavior on Others), and Triggers and Tools. And here's a third option for working on size of the problem... Place a piece of masking tape on the floor, numbered from 1 (teeny weeny problem) to 5 (huge emergency-sized problem). Write problems on index cards (or you can buy my Problem-Solving activity cards here). Read each problem aloud and have students place the card where they think it falls on the line. See if others agree. Did you read my blog post about the Pixar movie Inside Out? I made a whole big set of worksheets to supplement that (though your kids don't have to have seen the movie to use them---it just makes it more fun). I included a couple that address my complaint that the movie made it seem as if Riley was controlled by her emotions and had no agency over her own actions. Check them out in my store here. ​I found a great Minecraft Incredible 5-Point Scale® (Dunn Buron, 2003) on jabobsfamblog.com and tweaked it. I decided to add a third column for kids to fill in their preferred coping strategies. Click here to download two versions: the one to the left and one with all the boxes blank so they can fill in how each level feels and looks.